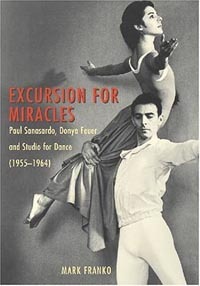 In his new book, Excursion for Miracles: Paul Sanasardo, Donya Feuer, and Studio for Dance, theater arts professor Mark Franko reexamines the overlooked early choreographic achievements of Sanasardo and Feuer, whose Studio for Dance in New York City was a bastion of early postmodern dance in the 1950s and a precursor for the radical changes in art and thought of the 1960s. A dancer with the company for five years (1964-1969), Franko delivers a firsthand account of his experiences, combining personal anecdotes with an extensive knowledge of ethnography, critical theory, and dance history. His perspective contains both a dance scholar's theoretical expertise and the visceral recollections of a dancer emotionally connected to a body of work. Seventy-five black-and-white photographs accompany the text. Franko has presented his work internationally since 1985 with his company NovAntiqua. 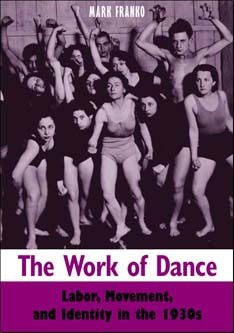 He is also the author of The Work of Dance: Labor, Movement, and Identity in the 1930s, Dancing Modernism/Performing Politics, Dance as Text: Ideologies of the Baroque Body, The Dancing Body in Renaissance Choreography, and coeditor of Acting on the Past: Historical Performance Across the Disciplines. For more information, contact Wesleyan University Press at (860) 685-7723. "Franko's readings and contextualization of Sanasardo's and Feuer's work situates them at the vanguard of an alternative postmodern aesthetic generally taught as emerging years later" —Stacey Prickett, "Dance Reseach"
How extraordinary everyday relationships shape dance. Excursion for Miracles is an intimate portrait of the early choreographic careers of Donya Feuer and Paul Sanasardo, and the artistic significance of their Studio for Dance in New York City. These two dynamic individuals were committed to breaking set ways of thinking about dance in relation to life, and their work with a group of very young children and dancers such as Pina Bausch anticipated radical cultural thought of the 1960s, particularly with the unrecognized masterpiece “Laughter after All.” Author Mark Franko, who danced with Sanasardo for five years, also brings to life the creativity and intimacy involved in four Feuer/Sanasardo evening-length ballets. The book is lavishly illustrated with 75 stunning black and white still shots of the dancers that capture their energy at precise moments, giving sight to the conversation and analyses surrounding them. Ritual today can be encountered in the midst of catastrophic and transforming events. The essays collected here reassess and revise traditionally understood relationships between ritual and politics, ritual and everyday life, ritual and art making as well as ritual and disaster. The methodologies as well as subject matter are interdisciplinary: they range from the anthropological to the art and dance historical, from the theatrical and literary to the linguistic, philosophical, and psychoanalytic. Although the book is interdisciplinary, the material could be used on graduate courses in a range of areas such as Anthropology, Art, History, Theater, or Performance Studies. Mark Franko Explores the complex relationship between dance, work and labor in the 1930s. In this insightful new book, Mark Franko explores the many genres of theatrical dancing during the radical decade of the 1930s and their relationship to labor movements, including Fordist and unionist organizational structures, the administrative structures of the Federal Dance and Theatre Project, the International Ladies Garment Workers Union, and the Communist Party. Franko shows how the structures of labor organization were reproduced and acted out - but also profoundly reasoned through in corporeal terms - by choreography and performance of the proletarian mass dance, the chorus line of the Ziegfeld Follies and the reflexive backstage musical film, Martha Graham's modern dance, the revolutionary dance movement of the proletarian avant-garde, African-American "ethnic" opera-ballet, and Lincoln Kirstein's "American" ballet. The contributions of many important personalities of American theatrical, visual and literary culture are included in this study. Franko's focus extends from the direct impact of performances on audiences to the reviewing, reporting and photography of print journalism. Mark Franko is Professor of Dance and Performance Studies at the University of California at Santa Cruz and the author of Dancing Modernism/Performing Politics (1995) and Dance as Text: Ideologies of the Baroque Body (1993). He is co-editor, with Annette Richards, of Acting on the Past: Historical Performance Studies Across the Disciplines (Wesleyan, 2000). "Written with clarity and urgency, this book will be of interest not only to dance scholars, but also to social historians, labor historians, and art historians, as well as all who seek a better understanding of the relationship between the arts and political change." "The Work of Dance enlarges conventional understandings of labor and of progressive politics through an elaboration of the agency of dance in performance. The book should garner the attention of those seeking to grasp that which made the 1930s in the United States so fruitfully contentious." Performance studies have been increasingly influential on recent developments in musicology, theater, art, and dance history, as these fields shift from primarily text-based disciplines to consider performativity, subjective experience, and particularized practice. At the same time, the editors argue, investigations into the pre- and early modern periods have been rare in performance studies. Acting on the Past assembles some of the foremost scholars to theorize particular historical performances in dance, opera, theater, and music as well as in festival, sculpture, rhetorics, arts of memory, moralized motions, muscial notation, improvisations, and even photography, aerobic videos, and critical theory. Exploring relationships between archive and act, text and sounding, subject and practice, this collection expands and redefines our understanding of both past and performance. 320 pp. 23 illus. 6 x 9"
"An extremely unusual collection, Acting on the Past establishes a dialogue between conventional and theoretical approaches to historical performance studies, on the one hand, and foregrounds the importance of early performance for an understanding of what has become known as the discipline of 'performance studies.' It reflects on the substantial play not only between performance practices and their carriers-the body, sound, movement, rhythm, time, etc.-but also between the many disciplines so crucial to our understanding of Western representation: rhetoric, drama, sculpture, photography, video, literature, as well as dance and music. The book will become an influential source text in performance studies, both old and new. For more information or to order this book, please click here. Dancing Modernism/Performing Politics is a revisionary account of the evolution of "modern dance." Questioning the common notion that the dancing image reflects a relation of dance to culture, Mark Franko calls for a historicization of aesthetics that considers the often-ignored political dimension of expressive action. Employing an interdisciplinary approach to dance analysis, Franko draws from performance studies, and cultural theory to study modern dance in relation to sexual, class, and modernist politics, ranging from Isadora Duncan, Martha Graham, and Merce Cunningham to less canonical figures such as Valentine de Saint-Point, left-wing "revolutionary" dancers of the 1930s, and Douglas Dunn. Viewing dance from this political-expressive perspective contradicts assumptions about the body's autonomy, and undermines tenets of modernist dance history. In an appendix, Franko includes articles of left-wing dance theory, which flourished during the 1930s. These represent the anti-modernist branch of American modern dance. "Franko's most important question [is]: "How much of dance practice materializes as visible, or should be understood in visual terms alone?" With this question, Franko's dance history as a history of ideas not only opens up the scope of critical inquiry, from the boundaries of the choreography to the social and historical context that surrounds it, but also, and most importantly, formulates a critique of presence and visuality." "Dancing Modernism/Performing Politics can be read as a text that exposes the historical interdependence of texts and calls attention to how a theoretical approach to dance needs to account for the fact that current writing is based on earlier writing. There is a written chain extending back to the dance event, with links subject to interruption and distortion, suppression, or complete erasure . . . The position of a historical analysis is now, not then." 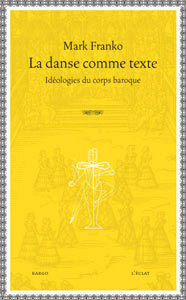 In a radically new interpretation of a neglected genre, the French Baroque court ballet, Dance as Text shows both how early ballet spectacle established its artistic identity by opposing conventional theaters of language, and how, as the dancing body gained autonomy from the spoken text, it became a subversive instrument expressing noble resistance to the growing centrality of monarchy. Focusing on the period from the late Renaissance to the Baroque, Professor Franko's imaginative, pioneering study not only illuminates the inherent political context of an ostensibly aesthetic medium, it also offers a close analysis - from both a historical and a theoretical perspective - of dancing itself. "This book rewrites the history of dance"
has dominated the field for the past decade." "This book is both an important revision of dance history and a major statement of dance theory." Ce livre retrace l’histoire esthétique et le profil idéologique du ballet de cour français entre 1573 et 1670. En examinant les formes chorégraphiques de cette période (le ballet burlesque du début du xviie siècle et la comédie-ballet de la deuxième moitié du xviie siècle), Mark Franko montre comment le corps a émergé d’un théâtre verbal pour devenir lui-même un texte dont l’autonomie s’est forgée en réaction à divers programmes politiques - telle l’expression de la résistance des nobles face au pouvoir de la monarchie de Louis xiv. L’itinéraire chorégraphique retracé dans cet ouvrage pose le problème de la dialectique entre l’autonomie du corps et les discours du texte. Après l’étude des livrets de spectacle, des théories dramatiques élaborées à l’époque et des reconstructions de spectacles baroques, La danse comme texte s’achève par une réflexion sur les travaux des chorégraphes modernes (Oskar Schlemmer, Edward Gordon Craig). De la danse baroque au performance art, cet ouvrage sur les idéologies du corps est, selon William Forsythe, « l’un des meilleurs livres jamais écrit sur la danse ». Traduit de l’anglais par Sophie Renaut. This innovative work is both a semiotic study of dance gestures and ceremonies and an in-depth analysis of texts about dance as found in French, Italian, and Latin literature of the Renaissance. Weaving together traditional rhetorical figures with modern theories of intertextuality, Franko offers a perceptive study of manners and decorum which illuminates the essence of Renaissance society itself. "This is an important early essay by a most impressive historian of the dance, who, miraculously, sees the seamless web linking various cultural and social forms and, still more wondrously, reads and thinks and writes about these links." "Both a pioneer and an exemplary piece of work." "...Filled with original insight, innovative thought and pertinent information for everyone interested in kinetic and sociological aspects of Renaissance Dance and the origins of ballet." “The Baroque Body” in The Cambridge Companion to the Ballet, edited by Marion Kant (Cambridge: Cambridge University Press, 2007): 42-50 & 296-297. “Eventful Knowledge and the Post-Ritual Turn,” Introduction to Ritual and Event: Interdisciplinary Perspectives (London: Routledge, 2007): 1-9. “The Quarrel of the Queen and the Transvestite. Sexuality, Class, and Subculture in Paris is Burning,” in Discourses in Dance 4/1 (2007) – in press. “Dance and the Political: States of Exception” in Dance Research Journal 38/1 & 2 (Summer/Winter 2006): 3-18. “Bausch and the Symptom” in Tanzscripte, edited by Gabriele Brandstetter and Gabriele Klein (Bielesfeld: Transcript Verlag, 2007): 253-264. “Mimique Revisited”, preface to the reprint of “Mimique” in The Migration of Gesture, edited by Carrie Noland and Sally Ann Ness (Minneapolis: University of Minnesota Press, 2006). “Period Plots, Canonical Stages, and Post-Metanarrative in American Modern Dance,” forthcoming in The Returns of Alwin Nikolais: Bodies, Boundaries, and the Dance Canon, edited by Randy Martin and Claudia Gitelman (Middletown: Wesleyan University Press, 2007) – in press. Transcription of the discussion that followed my presentation at Le Mas de la Danse (Fontvieille, France) in June 2000: “Expériences singulières,” in quant à la danse 2 (June 2005): 113-120. “Given Movement: Dance and the Event,” in Of the Presence of the Body: essays on dance and performance theory, edited by André Lepecki (Middletown: Wesleyan University Press, 2004): 113-123. This essay is reprinted in Ritual and Event: Interdisciplinary Perpsectives (London: Routledge, 2007): 125-137. “La théâtralité de Louis XIII et Louis XIV dans leurs rôles travestis aux ballets de cour du XVIIe siècle,” in Vraisemblance et représentation au XVIIe siècle: Molière en question, edited by Marco Baschera, Pascal Dumont, Anne Duprat, & Didier Souiller (Dijon: Interactions Culturelles Européennes, 2004): 201-213. “Epic Immobility,” in ballettanz: Das Jahrbuch (Berlin: Friedrich Berlin Verlagsgesellschaft, 2003): 70-73. “L’utopie antifasciste: American Document de Martha Graham,” in Etre ensemble, edited by Claire Rousier (Pantin: Centre national de la danse, 2003): 283-306. “Majestic Drag: Monarchical Performativity and the King’s Body Theatrical,” in The Drama Review 47/2 (T178) (Summer 2003): 71-87. Peut-on habiter une danse?” in Oskar Schlemmer: l’homme et la figure d’art (Paris: Centre national de la danse, 2001): 119-129.